President Muhammadu Buhari's wife, Aisha has sued Governor Ayo Fayose for claiming that she was involved in the controversial Halliburton corruption scandal. 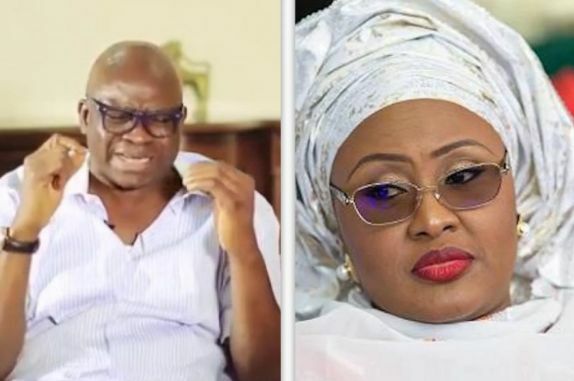 Fayose had said Mrs. Buhari was the 'Aisha Buhari' named in a US court document, said to have been involved in a bribery case involving a convicted former American lawmaker, Williams Jefferson. EFCC clarified that it was not Buhari's wife that was involved, but Fayose insisted she is the one. Aisha Buhari threatened to sue Fayose if he fails to withdraw the allegations and apologize. Since he has failed to do so, the wife of the President decided to act. According to PT, the court summons against Fayose is dated July 20, 2016. As governor, Mr. Fayose has constitutional immunity against criminal prosecution. But is a governor exempted from civil prosecution in his personal capacity?